Assessing the sensitivity and specificity of next-generation sequencing (NGS) based tests poses a challenge as it requires reference samples with known variants in all genomic regions that are included in the assay. The Genetic Testing Reference Materials Coordination Program (GeT-RM) is a CDC initiative that aims to improve the availability of appropriate and characterized reference materials for genetic testing. 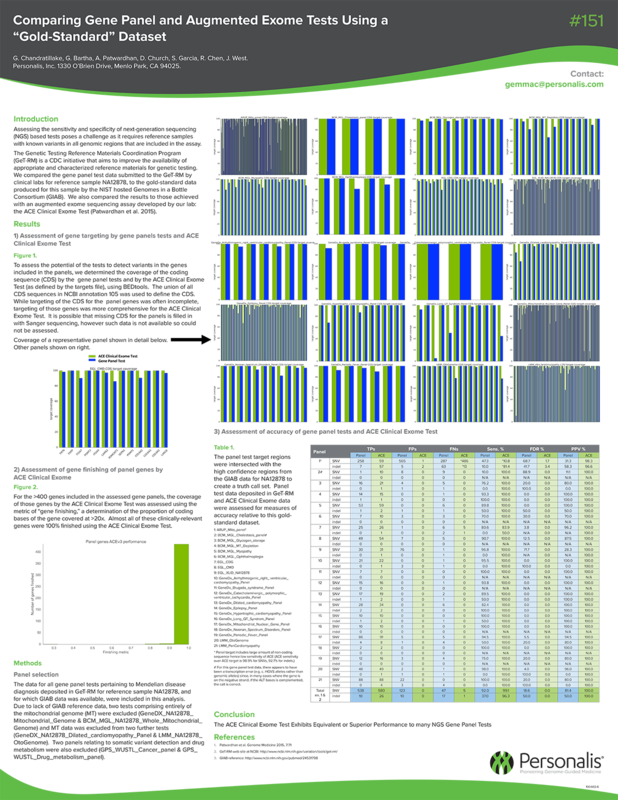 We compared the gene panel test data submitted to the GeT-RM by clinical labs for reference sample NA12878, to the gold-standard data produced for this sample by the NIST hosted Genomes in a Bottle Consortium (GIAB). We also compared the results to those achieved with an augmented exome sequencing assay developed by our lab: the ACE Clinical Exome Test (Patwardhan et al. 2015).